DermaClinix is one of the best hair transplant clinic in Delhi, India. 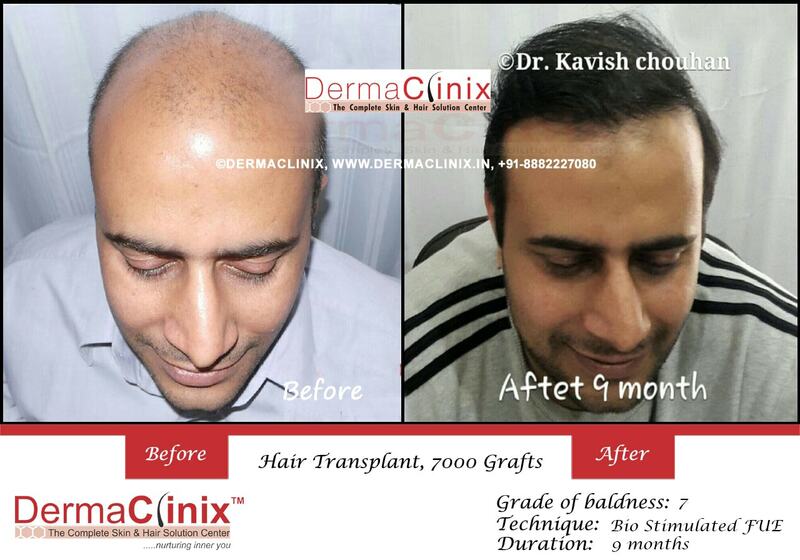 DermaClinix is led by the renowned and award winning hair transplant surgeon Dr. Kavish Chouhan, Dr. Amrendra Kumar is a Plastic and hair transplant surgeon of international repute and has done his Studying from All India Institute of Medical Sciences (AIIMS), DELHI one of the premiere institutes of Delhi, India. DermaClinix Now offers cutting edge hair transplant techniques for hair transplants like Follicular Unit Extraction (FUE) technique, Follicular Unit Strip Surgery, Body Hair etc. FUE or follicular unit extraction is a magical technique that will help you get relieved of baldness. Hair are thought to define an identity of a person. They act as an element of beauty to you. As people use artificial make up and accessories, hair are the natural make up god has gifted to all. At old age it’s natural to lose hair cover but at young age it can be due to a serious medical problem.